It’s something to make a great save, but also getting the Golden Ball at a World Cup, as the only goalkeeper ever, is one of the most impressive thing you can do as a goalkeeper. Besides being the best player at a World Cup Oliver Kahn made some great saves, such as the one in the game against Rep. of Ireland. After a header Damian Duff was completely free against Kahn in goal. But as we know, Oliver Kahn is the definition of fearless, and he jumped towards Duff and saved the shot. Is there a better feeling for a goalkeeper than saving your team during a World Cup final. 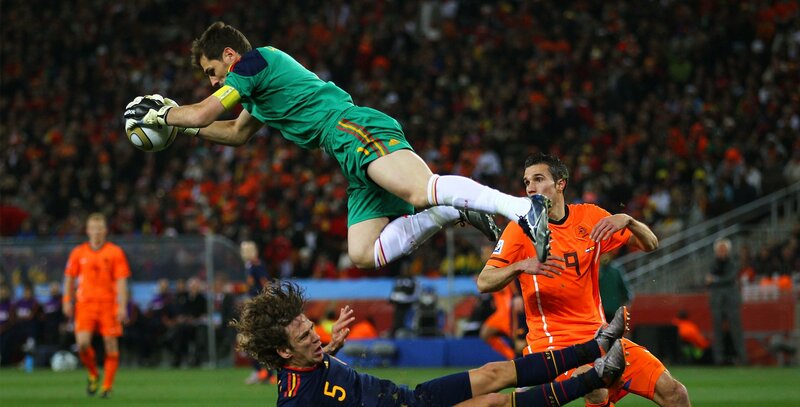 I can’t imagine something beating this, and this is exactly what the legend Iker Casillas did for Spain in the 2010 World Cup final against The Netherlands. After an hour of play Arjen Robben gets a free run towards the goal against Iker Casillas, and this is a perfect display of how important coolness and overview is for a keeper. Luring Robben to make the first move, Casillas slightly leans on to his left side, wanting Robben to shoot to his right, and when Robben does this Casillas’ just sticks out his foot and saves the day. Germany is known for producing some of the best goalkeepers, who often also makes some of the best saves in the world. This is no exception for Toni Turek and his save against Hungary in the 1954 World Cup final. Everybody including me, when watching the video, saw the ball go in. But Turek had other things on his mind, and with the blink of the eye he saved the shot. Try watching the video and make sure not to miss the save! Read our World Cup preview for alle the details on the groups! Making one great save is special. But making three great saves in a row is exceptional goalkeeper work. Kossi Agassa from Togo made three saves against France in the 2006 World Cup where he firstly stopped a long shot, and then a close shot from David Trezeguet, before ending up with stopping the ball on the line. That’s a perfect example of excellent keeper work. To see the save forward the video to the 36s second. This right here might be one of the most iconic saves in the history of the World Cup. After a cross Pelé jumped highest on the ball and headed in towards the goal. Gordon Banks was caught a bit wrong by the cross and had to do some movement to get to the goal, and this is why the save gets the first place on our Top 5 list. Nobody ever imagined that Banks would get back and save the ball on the line while tipping it over the goal. Many considers this save as one of the very best of all time in the World Cup. Do you agree?